Kamen Rider Kabuto The Movie: God Speed Love (劇場版 仮面ライダーカブト GOD SPEED LOVE Gekijōban Kamen Raidā Kabuto Goddo Supīdo Rabu?) is the theatrical film adaptation of the Kamen Rider Kabuto TV series directed by Hidenori Ishida and written by Shōji Yonemura. This movie takes place in an alternate universe. In this reality, the impact of the first meteor evaporated all of Earth's oceans and plunged the Earth into chaos. Seven years after the meteor hit Earth, ZECT plans to use a passing comet to refill the Earth's oceans, unaware that their plan will cause another meteor to crash on Earth, one large enough to destroy the world. 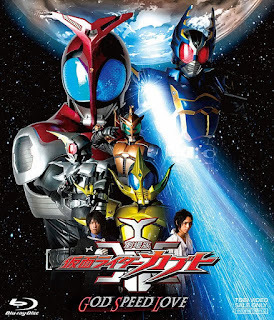 The film was produced by Ishimori Productions and Toei, the producers of all the previous television series and films in the Kamen Rider franchise. Following the tradition of all Heisei Kamen Rider movies, it is a double bill with 2006's Super Sentai movie, GoGo Sentai Boukenger The Movie: "The Greatest Precious". Upon its release, the movie was the second highest selling family movie of the week coming in at 4th place. A Director's Cut version of the movie was released on May 2007.